Bass guitars are very delicate instruments that often cost a lot of money so you want to make sure they are protected. Despite how careful you may be with your bass guitar, it’s likely to get injured or broken if you don’t protect it well. 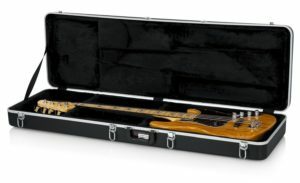 That requires a quality bass guitar case, whether you get a gig bag or hard case. A bass guitar case or gig bag also makes carrying your bass guitar much easier! 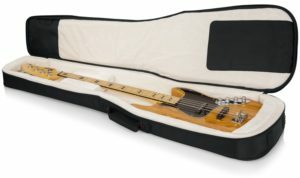 A soft bass guitar gig bag will protect the bass guitar from most scratches, but protection from anything more severe, such as a drop, requires a hard bass guitar case. 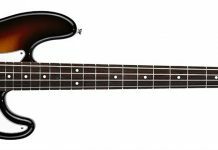 Below we have evaluated the 8 best bass guitar hard cases and gig bags so that you can protect your bass guitar with the right case for your needs. When picking your bass guitar case, keep in mind the main way you will be transporting your bass guitar. If you plan on flying a lot, buy one of the hard bass cases intended for flying below. If you’re walking or biking a lot, a lightweight gig case probably sufficient. With that in mind, let’s get to the best bass guitar cases and gig bags. The MONO M80 bass case is a well-made, well-padded bass guitar case that not only looks cool but is exceedingly functional. It comes with 2 gear pockets that also have built-in cable management, shoulder and chest straps, and a waterproof shell. Overall this is our favorite bass guitar case. 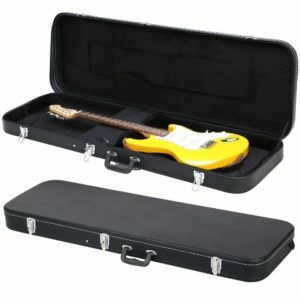 The ChromaCast CC-BHC is a very affordable bass guitar hard case that has everything you’d want from a hard bass guitar case. With lots of internal storage, lockable latches, and great padding, this bass case is designed for the active musician. 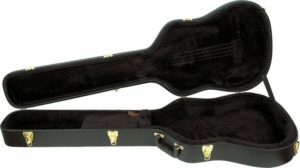 This is a great overall acoustic bass case. It comes with a plush-lined interior to protect your bass guitar and accessory compartments to store all of your accessories. This case is extremely sturdy. Keep in mind however that this is specifically designed for the AEB model of Ibanez bass guitars, so make sure it will fit your acoustic bass guitar before buying. Traveling with a bass guitar on a plane can be extremely dangerous. 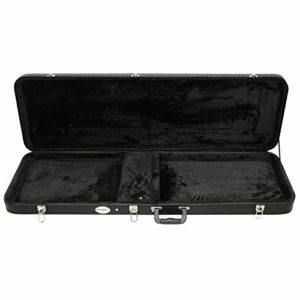 If you’re forced to check your bass guitar, you’ll want the Gator Cases GWP-BASS flight case. It’s waterproof, dustproof, and impactproof. The internal padding and support make this bass case the best option for travel. If you’re looking for ultimate protection from your gig bag, the Gator G-PG BASS Pro Go Series gig bag is for you. While not as stylish as the MONO case above, the Gator bag has the most padding of any of the cases on this list yet weighs only 7lbs. The exterior pockets have plenty of space for accessories and even a pull-out rain cover. The thing we love about this bass guitar bag is that you can unzip the bag completely, unlike many other gig bags. This makes loading the bass much easier with less risk of dropping it. 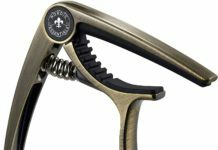 This is a great gig bag for beginners as it is very affordable (less than $30 at the time of this writing) and features the basic essentials any beginner needs. It comes with lots of padding (20mm thick walls), 3 large pockets, and backpack-like straps for carrying. If you are a beginner looking to buy a gig bag that “just works,” this is it. 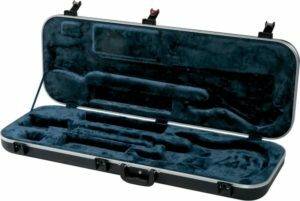 Another great hard bass guitar case that can also serve as a flight case if you don’t want to buy the Gator flight case above. It features high-quality ABS material to protect your instrument and TSA latches so that you can securely transport your bass guitar through security at the airport. It also comes with 3 pockets to securely store your accessories. If you’re looking for a solid bass guitar hard case, the Yaheetech will do. While we don’t recommend it for flying, it is certainly durable enough for around town gigs. 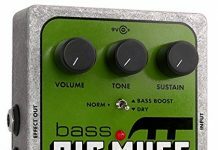 Its design fits most bass guitars, regardless of their style. If you’re looking for a no-frills hard bass guitar case, this is a great option. As you can tell from this list, we are fans of the Gator Case line. The Deluxe case is a more basic version of some of Gator’s other cases, but it still has everything you need. It is designed to fit most styles of bass guitar and has two interior pockets for storing accessories. This is a great case for local gigs since it provides ample protection, but it is not sturdy enough to handle flights. Whichever bass guitar case or gig bag you end up choosing, make sure you test it before you trust it with your valuable instrument. Don’t just trust the case for flights before you have fully tested the case at home. Most bass guitar cases are very similar with the main differences being in weight and pressure rating. Both of these traits ultimately influence the price of the bass guitar case which is why cases with better pressure ratings and less weight tend to be more expensive. How you transport your bass most frequently will influence which case you buy. 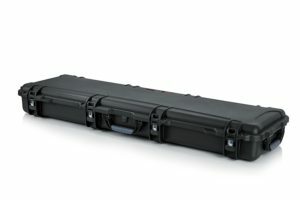 If you want a case that can withstand flights, get the Gator flight case above. If you’re looking for a case that’s extremely lightweight, the World Tour gig bag is your best bet. Figure out what your main priority in a case is before you purchase your case or gig bag. Previous articleWhat is a fretless bass guitar?